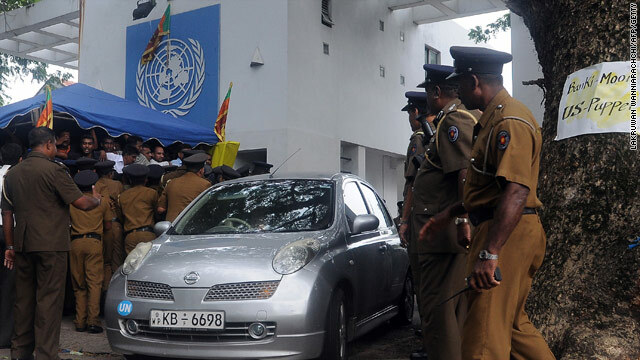 Sri Lankan police officials assist United Nations staffers exiting the UN office during a protest rally in Colombo. Colombo, Sri Lanka (CNN) -- Protesters led by a Sri Lankan cabinet minister laid siege to the United Nations compound in Colombo on Tuesday, demanding that the world body drop a probe into alleged human rights abuses in the final stages of the separatist war that ended last year. Staffers were prevented from leaving as a crowd of about 1,000 surrounded the compound and burned an effigy of U.N. Secretary-General Ban Ki-moon. Their placards told the United Nations to stop interfering in Sri Lanka's affairs. Ban named a three-person advisory panel last month to look into possible human rights violations committed during the war between the government and the Liberation Tigers of Tamil Eelam. "The secretary-general remains convinced that accountability is an essential foundation for durable peace and reconciliation in Sri Lanka," a statement from Ban's office said. "Through the panel, the secretary-general expects to enable the United Nations to make a constructive contribution in this regard. Scuffles erupted Tuesday when U.N. staff tried to leave the compound. Police charged the crowd with batons, wounding at least six people. Wimal Weerawansa, a minister in President Mahinda Rajapaksa's government, said the protesters planned to return Wednesday. The United Nations objected to the demonstration led by Weerawansa. "While respecting the right of citizens to demonstrate peacefully, preventing access to U.N. offices hinders the vital work being carried out by the United Nations each day to help the people of Sri Lanka," U.N. spokesperson Farhan Haq told reporters in New York. "The government has provided assurances for the safety and security of our staff and for their full access to their offices," he added. "We will be closely monitoring developments and trust these commitments will be honored." Sri Lanka's decades-long war, through which the Tamil Tigers were seeking an independent homeland, ended with a ceasefire in May 2009. More than 65,000 people died in the strife. The United Nations has been concerned about accountability issues related to the military defeat of the rebels, including alleged war crimes by troops and rebels -- allegations that both parties deny.